..A VIEW FROM THE BOW OF A SHIP! Exquisite comfort. The only thing exceeding the quality of the home is the quality of the view. 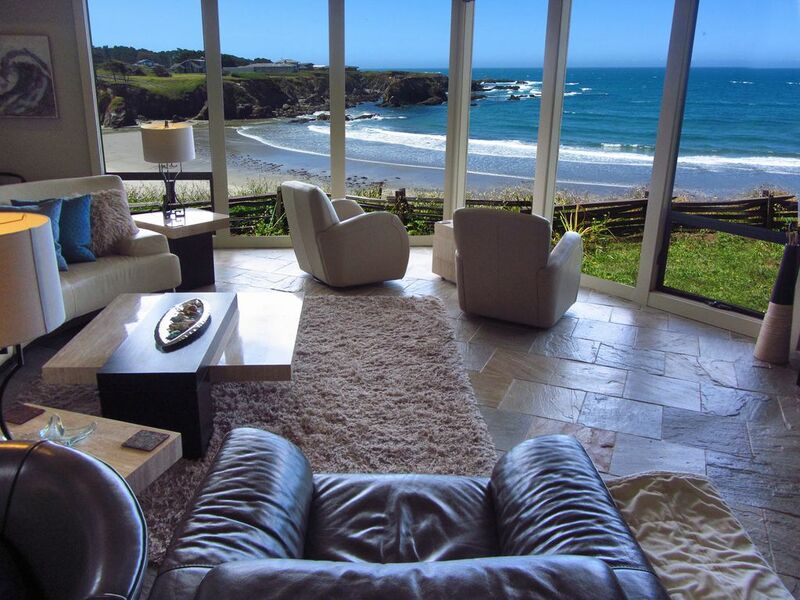 Relax in elegance in our newly remodeled oceanfront home on the Mendocino coast or use it as a base to visit the many local attractions. Listen to the Pacific Ocean while you barbecue or view the stars while sitting in the hot tub in the evening. View soaring sea birds at eye level. Autumn and spring bring the whales offshore on their annual migrations. You are an easy drive to some of the best restaurants on the coast and 5 to 10 minutes to groceries, pharmacies, movies and shopping. Noyo harbor also has some very fine restaurants or you can book whale watching & deep sea fishing trips - just minutes away. Vacation year-round, as the home is kept comfortable with cool ocean breezes in the summer and gas fireplace and Monitor heater during the winter months. And, if you are at the house at the right time, you can watch the beauty of winter storms from the comfort of our fully furnished home. From the most elegant halogen light fixtures, a chef's dream of a kitchen (fully equipped), tasteful original artwork, extensive slate floors & abundant skylights, this home offers features not found in other short-term rentals. The bathroom tile work alone is beyond compare and is complemented by the upscale plumbing fixtures. The kitchen features stainless appliances, granite countertops, wine & drink cooler, produce pantry & crisper, two food prep sinks, commercial gas range, 2 ovens, microwave & built in dinette with matching granite countertop. The floor-to-ceiling living & dining room windows gaze out to fabulous Hare Creek Bay where you can watch local surfers, birds & whales (Dec-Mar). Take a short walk to the beach - this is the only home in the area that has a deeded access to the beach via a spectacular brick stairway through a eucalyptus grove. Perched 30 feet above the bay, the southwest facing views take full advantage of sunlight throughout the year. Relax, refresh & reflect - 'A New World' awaits you! Nothing, and no place could have been better! My girlfriends and I have been coming to the coast for over 20 years! We were one of the firsts groups to stay at “A new world” when they first started renting this fabulous home. We have stayed here several times due to its perfect location, perfect ocean view, perfect beach access, and perfect accommodations! Always clean, always welcoming and always stocked with all the necessities we need! We truly love this get away! Already planning next years trip!! We had only one regret - that we couldn’t stay longer. The home and location is perfection! It was so nice to stop here and relax on our coastal tour. Our entire family agreed it was our favorite stop of the week. We have stayed in a lot of homes on the coast from Bodega Bay to Ft. Bragg and beyond. This house is special by all accounts. The views are beyond awesome and the home is totally equipped with all you need. We actually were looking to go back for a week in October after we came home only to find that the home was pretty much booked. Cheers to the owners...this is a rare gem! Thank you Robert and Lynda for sharing your awesome home with all of us. Loved the house; gorgeous view and very well stock kitchen. Very pleasant stay. PLEASE NOTE -- A MAXIMUM OF 8 PEOPLE ALLOWED IN ANY BOOKING. Contact Lynda at 916-765-3292 or reply to owner through VRBO. Rates are based on 2 guests; add $25 per night per additional guest.